Beautiful 2 bedroom villa positioned in the quiet residential village of Ilgaz in the Besparmak mountains overlooking the sea. 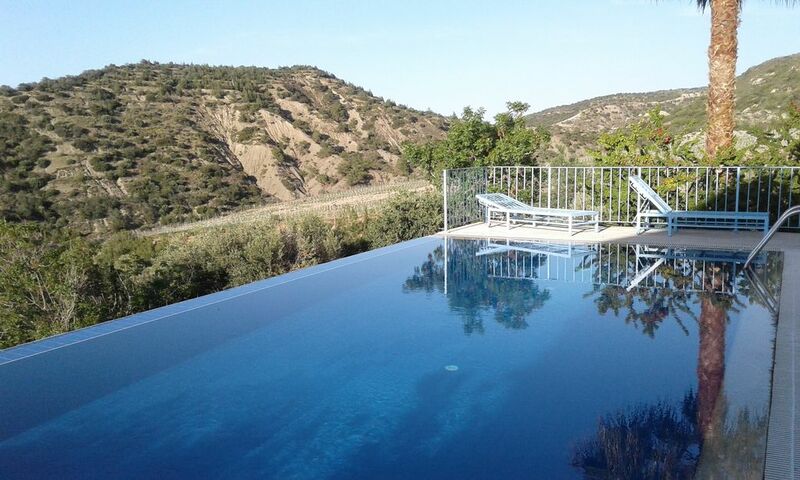 Situated in a mature garden, the villa has an infinity pool, 8m x 4m with underwater lighting and views of the sea and fabulous views of the sunset over the mountains. The spacious sitting room has French doors and windows on 3 aspects and the fully equipped open-plan kitchen has French windows onto its own terrace. The villa is surrounded by terraces with glass and marble topped tables, chairs, sun-loungers and a built-in BBQ. I have lived in Ilgaz since 2007 and am married to Öztürk (Oz) who built villas CY1696 and CY3823. I am English and Oz is Turkish Cypriot. Originally from Paphos, Oz fell in love with Ilgaz village in 1974 and achieved his dream of living here about 15 years ago. We have 2 dogs, Zibidi and Maymun along with long-eared goats and their kids. We love the peace and community spirit of the village which has both English and Turkish residents and waking up every morning to spectacular views. We enjoy meeting new guests and hope that they enjoy Ilgaz as much as we do. We have a number of guests who return year after year. As we live in the village we are on hand to help out in any way necessary and we do our best to ensure that you have an enjoyable and memorable holiday in North Cyprus. Oz built the villa about 12 years ago. It is situated at the lower part of the village and has uninterupted views down the mountain to the sea. Being on the edge of the village means that you can have as much or as little interaction with the village as you like. There are numerous mountain walks that you can take straight from the front door. En-suite to bedroom 1 with shower, wc and basin. Bathroom with shower, wc and basin. Please note there are three steps leading into the bathroom. Second bathroom is downstairs with shower, wc and basin. The villa has central heating and for the occasional winter day when solar power is not adequate, water is heated by combi boiler. There is a log fireplace in the sittingroom. Logs can be arranged. 100% cotton sheets provided. For stays longer than a week, beds will be made with clean linen weekly or more often if requested. Washing powder and conditioner provided. Bath towels and swimming towels provided. Clean bath and hand towels provided weekly. Internet is the highest spec possible according to the providers. Spacious open-plan area with 3 French windows opening onto terraces and views on 3 aspects towards the sea and mountains. 3 seat and 2 seat sofas, coffee table, TV and DVD player, radio/CD player and stone fireplace. Generous welcome pack provided including bread, butter, eggs, tomatoes, cheese, olives, honey, tea, coffee, milk, juice, drinking water and wine. Other requests welcome. The kitchen is fully equipped with many dishes and utensils. If there is something we have missed out, please let us know. Large, light fully equipped kitchen with table and chairs granite worktops. French windows opening onto terrace with marble topped table and chairs. Some dvds in the villa. There are shops nearby selling dvds and we have plenty more to chose from. There are a variety of books in the villa. There are a number of DVDs in the villa. We can supply more. Mature and established garden with bourgonvillea, plumbago, geraniums and a number of trees. Both bedrooms have balconies at the front and rear of the villa. Terrace in front of the kitchen with table and chairs. Beside the villa is another table and chairs near the barbecue. Beside the pool is a large terrace with four sunbeds. Korineum Golf and Country Club has a championship 18 hole course and is approximately 40 mins drive from the villa. CMC Golf Club is approximately 50 mins drive from the villa. Smoking permitted on the terraces. Private 8m x 4m infinity overflow pool. Only for the use of guests staying in the villa. The pool is not overlooked by others. Notes on accommodation: Welcome pack provided. Car hire and airport transfers can be arranged. The Cypriot owner (who built the villa) and his English wife live nearby and are happy to provide assistance or advice if needed. Languages spoken fluently -English, Turkish and Greek. Whenever possible we try to use local products in the welcome pack such as bread baked in traditional style ovens in Ilgaz village, eggs laid in the village, locally produced olives and olive oil. Outside: The villa is set in its own mature garden and has its own private infinity pool 8m x 4m with underwater lighting. The terraces have 2 tables (1 glass top, 1 marble top) with chairs and sunbeds. Built in BBQ. There is a canvas covered shaded seating area with views to the sea. Cleaning / Towels / Linen / Maid service: 100% cotton bedlinen and towels provided. Villa cleaned before guests arrive. For longer stays linen and towels changed weekly or more often by arrangement. Pool towels provided. Pool and garden professionally maintained. Other: Mezzanine floor between the bedrooms. The villa & location were perfect. A few bars & Cafés, as well as the faily new, wonderful winery & hotel restaurant all within walking distance. The views from the villa & infinity pool across the mountains is spectacular; so peaceful & calming. There were a few resident cats/ kittens wandering around the pool waiting to be fed in the mornings, which were cute. The owners Carola & Oz live locally & were very welcoming & friendly & the cold beers, wine & basics in the welcome pack were a nice touch. I would recommend hiring a car, though as there are lots of rocky coves & beautiful places to visit. The local supermarket is a 5 minute drive away, but there is a bakery within walking distance. Overall I would definitely recommend staying in Ilgaz for a relaxing break. The owners also have several other villas in the same village for larger group family holidays. Thank you Ann for your lovely review. It was lovely to meet you both and we are delighted that you enjoyed your stay in Villa Lisa and your experiences at the winery and Gillham Vineyard Hotel's restaurant. We hope to see you again in Ilgaz. Fantastic villa. Everything you need for relaxing, private sojourn. Hosts could not have been more helpful, engaged and charming. Can’t wait to come back. More than exceeded our expectations. Thank you for your lovely review. It was a pleasure to meet you both and we look forward to seeing you again in Ilgaz. We have just spent a wonderfully relaxing week at Villa Lisa. The owners are genuinely perfect hosts. The villa is very well equipped and very clean. It feels very light and spacious. The views are just amazing. Just a short scenic drive will take you to many lovely restaurants and places of interest. The owners arranged our taxi and hire car and both were totally hassle free and we found it to be cheaper than airport collection. Several supermarkets are a few minutes drive from the villa. For us it was the perfect location - the peacefulness of being in the mountains and the pretty village of Ilgaz but only a short drive to visit attractions etc. And if you like running, or walking there are numerous paths you can take to the mountains right on the door step. Thank you so much for your lovely review. It was a pleasure to meet the three of you and we hope to see you again one day in Ilgaz. It was lovely to see you all again in Ilgaz and we look forward to your next visit. It was lovely to see you and your delightful family back in Villa Lisa and we look forward to seeing you for a third time. Enjoyed a wonderful fortnight ar villa Lisa. The property is very clean and well maintained with everything you need contained within the villa. We were very comfortable throughout our stay. The views are spectacular. I cannot imagine anyone being disappointed with this villa. Thank you Carola and Oz for making us feel so welcome And looked after. We are delighted that you enjoyed your stay in Villa Lisa. It was lovely to meet you all and we hope to see you back in Ilgaz again one day. Etel Winery. A few minutes walk from the villa is Etel Winery. Past the winery in amongst the vineyards is the Tasting Room where you can sit, relax and enjoy a selection of delicious wines. There are many lovely beaches nearby, some with restaurants or cafes. The closest is 3km down the mountain. Some beaches provide water sports such as diving, snorkeling and a couple with jet skis. Boat trips can be taken along the coast in day-time or evening trips usually with food provided and various coastal stops along the way. Ercan Airport in North Cyprus is the closest airport and is about 50 mins drive. Airlines include Turkish Airlines and Pegasus. You will have to briefly land in Turkey. Larnaca Airport in South Cyprus is about 75 mins drive. Many airlines fly direct from UK including British Airways, Cobalt, Easyjet, Blue Air and Hahn Air. A taxi can be arranged to collect you from Larnaca and bring you across the border direct to the villa. Car hire is highly recommended and your hire car can be delivered to the villa. We can arrange car hire and airport transfer. The property is situated on the edge of Ilgaz village in the Besparmak (Five Finger) mountains and is 3 kms up from the main road near Alsancak and Karaoglanoglu and above Yesiltepe. Ilgaz is a quiet residential village with vineyards, olive groves and many almond trees. The village of Karmi/Karaman is about 40 mins walk across the mountain. Kyrenia harbour is about 20 mins drive and St Hilarion Castle and Bellapais Abbey are about 30 mins. The Korineum Golf and Country Club in Esentepe is about 40 mins drive. There are many beautiful mountain walks around Ilgaz which can start straight from your door. Look for mushrooms in winter and wild orchids in spring. Other activities in the area include horse riding, mountain biking, paragliding, jeep safaris, diving, snorkeling and boat trips along the coast. There two restaurants / cafes in the village of Ilgaz within a few minutes walk from the villa. Ilgaz Village Café has freshly prepared Turkish meals along with bread baked in its own traditional style bread ovens. Hoots Bar / Restaurant has a charming vine-covered courtyard. 2 km down the hill is Green Heights Park Restaurant set in award-winning gardens with a large pool and jacuzzi for customers' use. Many of the restaurants nearby have pools and cater for most tastes such as Turkish Cypriot, British, Chinese, Indian, Italian and a number of excellent fish restaurants. There are plenty of supermarkets nearby selling fresh produce such as fruit, vegetables, meat and bread. Many sell freshly prepared meals. The cost of eating out in North Cyprus is very reasonable. Fresh eggs and bread can be purchased daily from the village. Booking Notes: A 25% deposit is required to secure your booking with the balance of payment 60 days prior to arrival. If you find that this villa is already booked for your desired dates we have a two other two bedroom villas both with private pools also in Ilgaz which may be available for your chosen dates. We now taken on a 4 bedroom in Ilgaz, again with a private pool. Changeover Day: We are flexible with changeover days dependent on other bookings. Check-out time 10am. Check-in time 4pm. (unless by prior arrangement). We try to be as flexible as possible with check-in and out times dependent on other bookings. Notes on prices: Prices shown are per week in UK Pounds (sterling).